security settings to determine how attachments are handled. If you are in the UK, Australia, Ireland, Belgium or Luxembourg you get one binary [VT 12/64], everyone else gets another [VT 20/64]. My Online Security describes this in more detail - the first group get the Trickbot banking trojan and everyone gets Locky ransomware. There may be other locations too. All these recent attacks have used .7z archive files which would require 7zip or a compatible program to unarchive. Most decent mail filtering tools should be able to block or strip this extension, more clever ones would be able to determine that there is a .vbs script in there and block on that too. This fake financial spam leads to the Trickbot banking trojan. 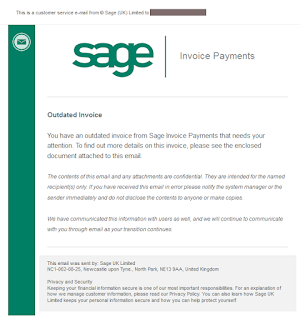 You have an outdated invoice from Sage Invoice Payments that needs your attention. 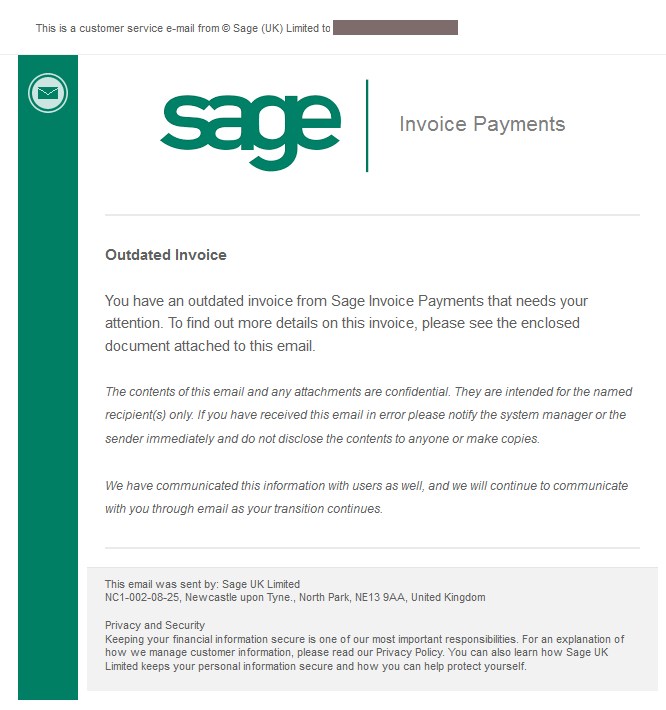 To find out more details on this invoice, please see the enclosed document attached to this email. The contents of this email and any attachments are confidential. They are intended for the named recipient(s) only. 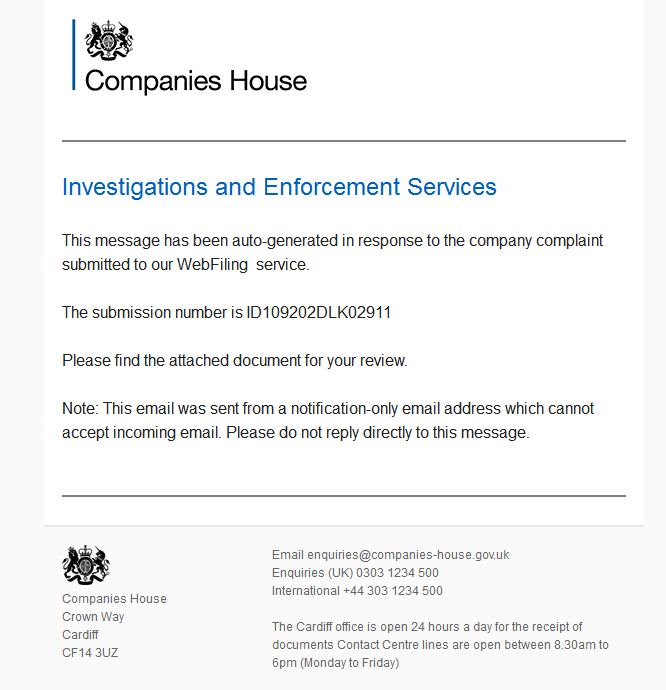 If you have received this email in error please notify the system manager or the sender immediately and do not disclose the contents to anyone or make copies. We have communicated this information with users as well, and we will continue to communicate with you through email as your transition continues. 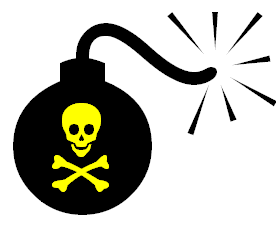 A malicious file scsnsys.exe is dropped with a detection rate of 8/53. I recommend that you block traffic from that domain or check your filters to see who may have it. This message has been auto-generated in response to the company complaint submitted to our WebFiling service. Please find the attached document for your review. Note: This email was sent from a notification-only email address which cannot accept incoming email. Please do not reply directly to this message. Unlike recent Locky spam runs, this TrickBot run has gone to a lot of effort to look authentic. Both those domains are close to the genuine one of companieshouse.gov.uk and because the email is digitally signed it might get past spam filters where normal botnet-sent spam wouldn't. All the emails that I have seen have been sent via servers at 172.99.84.190 and 172.99.88.226 (a Rackspace customer apparently called OnMetal v2 IAD PROD). I recommend that you block email traffic from those IPs. 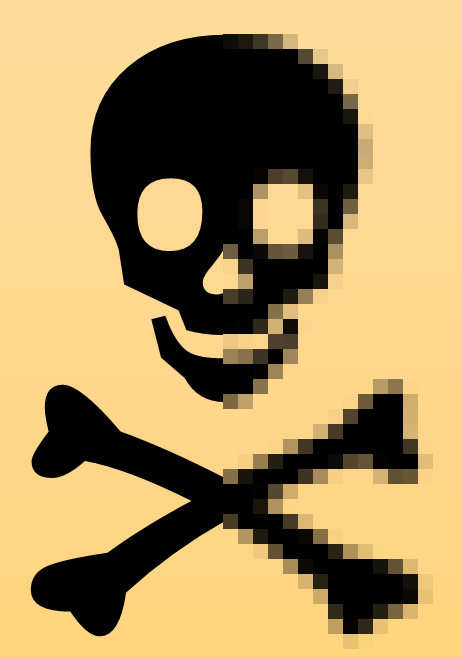 This is saved as sweezy.exe and has a detection rate of 7/57. At present that download location is down, probably due to exceeding bandwidth quota. The uadomen.com IP ranges (as discussed yesterday) are a sea of badness and I recommend you block traffic to them. 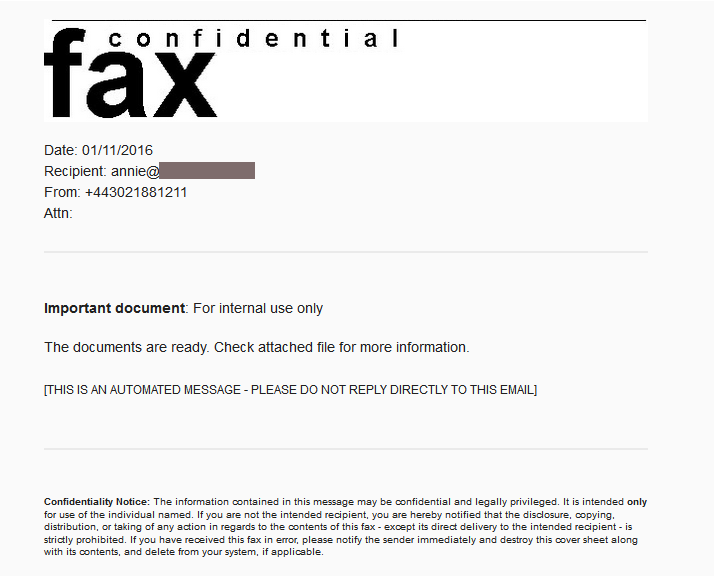 This fake fax leads to TrickBot which appears to be similar to the Dyre banking trojan that we saw a lot of last year.. The documents are ready. Check attached file for more information. Confidentiality Notice: The information contained in this message may be confidential and legally privileged. It is intended only for use of the individual named. If you are not the intended recipient, you are hereby notified that the disclosure, copying, distribution, or taking of any action in regards to the contents of this fax - except its direct delivery to the intended recipient - is strictly prohibited. If you have received this fax in error, please notify the sender immediately and destroy this cover sheet along with its contents, and delete from your system, if applicable. 3NT Solutions (aka Inferno Solutions / inferno.name) are very, very bad news and I would recommend blocking any IPs you can find for this outfit. FLP Kochenov Aleksej Vladislavovich aka uadomen.com has appeared here so many times             that really I have to categorise that as an Evil Network too. However, there's more to this too. The original email message is actually signed by local-fax.com and it turns out that this domain was created just today with anonymous registration details. The sending IP was 104.130.246.8 (Rackspace, US) and it also turns out that this is widely blacklisted and is probably worth blocking. All the samples I have seen show a consistent MD5 of e6d2863e97523d2f0e398545989666e4 for the attachment, and all the recipients I have seen begin with the letter "a" curiously enough..